SAFEC has seen intense activity in the last few weeks. The publication of government budgets sometimes modifies certain business assistance policies often resulting in changes to programs by their managers. SAFEC's database is constantly evolving to bring you information that meets your expectations. We listen to our users, our products and services evolve and we want to offer a maximum flexibility to our members and subscirbers. We changed our offer to better meet their expectations by offering more flexible rates that are better suited to their needs. Take advantage of available assistance! P.S. We invite you to forward this email to your colleagues, staff and anyone that may be interested in SAFEC – Support, Assistance and Financing for Entrepreneurs in Canada. The price of training sessions remains unchanged (for more details, click here). Automatic notifications of changes to programs that specifically meet your needs thanks to our new Alerts Sytem. One hour of Support Service with a SAFEC advisor who will provide you the tools to optimally manage information obtained on the programs. For more information on our offers, click here! Those of you who have already created a Business Project Description on our website have already received their first Alert Report. An Alert Report will be automatically emailed to you on a weekly basis. We invite you to log in to your user account today to discover the power of our monitoring system, automatically informing you of changes to the programs corresponding to your project needs. To log in to your account or open a user account and create a Business Project Description, click here! Every day for the last 30 years, Moisson Montréal has fought for a fundamental right, sufficient food with access to a variety of nutritious and quality food. SAFEC supports and encourages the fundamental mission of this organization and shares the same values. Ensure an optimal food supply to community organizations serving Montreal's people in need. Participate in the development of sustainable solutions promoting food safety. Moisson Montréal is always searching for sponsors and funds to ensure its continuity of action. In this context, SAFEC offers its skills and expertise to help raise funds to pursue their mission. With the help of SAFEC, Moisson Montréal benefits from information on financial and non-financial assistance programs specifically corresponding to their needs. SAFEC's web tool selected 480 programs relating to Moisson Montréal's activity among 2,200 programs in their database. Relevant and up-to-date information on these programs as well as SAFEC's personalized Support Service will help Moisson Montréal develop their capabilities in raising funds, for a sum of several hundreds of thousands of dollars per year. For more information on the assistance with which you may provide Moisson Montréal to support those who are hungry, click here! Program funds will be filled as of April 1! Prepare NOW and be the first to benefit from financial and non-financial assistance programs that will soon be available. Only 7% of SMEs use government assistance to finance their activities while you pay all the taxes contributing to these funds. Act now and reverse the trend! Take advantage of our exceptional offer! Simply participate in one of our training sessions learn everything you need to know to submit your applications to program managing organizations. To know how we can help your business, participate in the next Webinar on Tuesday, April 8, 2014. Space is limited, register quickly by clicking on the online registration form. It's free! Discover your chances of receiving subsidies or financing to realize your projects. And, it's free! 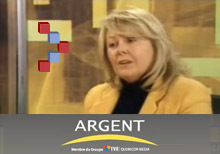 On October 29, 2013, Ms. Françoise Bertrand, President of the FCCQ and Ms. Reine Smith, Executive Director of SAFEC, were invited by Mr. François Gagnon of Canal Argent to discuss the exclusive partnership between the two organizations. The FCCQ chose SAFEC as a strategic partner to help fulfill its mission, which aims, among other objectives, to support businesses as much as possible and contribute to economic development in Quebec.